So I’m brand new to Synfig. I just downloaded it today since I’ve been looking for free alternatives to Flash. I seem to have everything else working fine, but unfortunately my graphics tablet’s pressure sensitivity is not working, which is very important to my work. Neither of these options seem to correspond with my tablet or pen. 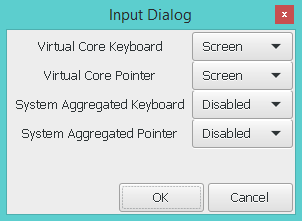 I tried disabling options which I’ve seen suggested, but the Virtual Core options will not stay disabled, even when the other two options are enabled. I had a similar problem when using my tablet with GIMP and it turned out to be an issue with my driver software, but I don’t think this is the same here. Basically I am able to use my tablet with Synfig, but it only functions as another mouse with no pressure sensitivity. I do have the Pressure Sensitivity checkbox selected in Drawing mode. My tablet is a Monoprice tablet, and I’m running Windows 8.1 64-bit. I had a similar problem when using my tablet with GIMP and it turned out to be an issue with my driver software, but I don’t think this is the same here. What makes you think it is not the same problem than Gimp? Well, to be sure, I just updated my driver (and sure enough there was a newer version), and tried it again. It still works fine in gimp, but I still have no pressure sensitivity in Synfig. It’s also still not appearing in the Input Devices list. I’ve also repeatedly tried the “Rename settings folder and generate a new one” trick, and that’s not doing anything either. I use it with both Inkscape and Gimp. It seems to be working with everything but Synfig. I’m guessing this forum isn’t very active, at least in the technical department. I just tried uninstalling the program and reinstalling it with my tablet plugged in (which it wasn’t before) in case there was some kind of detection going on during installation that I missed. There is not option for us to help you more on this matter because it is a specific hardware problem. We rely on Gnome/Gtk drivers/code to read input from devices so without a physical tablet it is difficult to know what’s happening. That’s what happen with some hardware vendors that doesn’t collaborate opening their drivers sources to allow free/open source people create a good driver for their programs. Most of the current working drivers on free/open source are coded by reverse engineering. Obviously, that huge effort is only done for popular hardware so not all brands work correctly. Ok, so just report it as a bug then? Update: Nevermind… I’m trying to send the report and I get “Error: null” when I try to post it. I also discovered that the Monoprice 5x8 tablet is nothing more than a redistributed, rebranded Huion H58L. I went to the Huion website to download that driver, but it seems to be the exact same software, so as you would expect, it still isn’t working.